The town of Loreto is a magnet for its “perfect” climate (average temperature is in the 80’s) and vacation activities, along with its beaches. 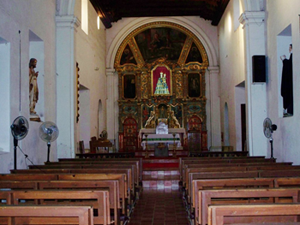 It is also known for its famous church: the mission Church of Our Lady of Loreto, the first mission church of the Californias. Lower and Upper California”). The mission is steps away from the shimmering, sapphire-blue waters of the Sea of Cortéz. Loreto, “the oldest permanent settlement in all the Californias” is located on the eastern coast of the Baja California peninsula at the base of the Sierra de Gigante mountain range, 700 miles south of San Diego. Loreto became the capital of Baja Sur and thus, was the first capital of the Californias. of Loreto served as his headquarters. Loreto was also the “cornerstone” and central departure point for missionary expansion northward into Alta California, Arizona, New Mexico and Texas, from which new missions and new towns and cities came into existence. The mission of Loreto was founded by Italian-born Jesuit and explorer Father Jean Marie de Salvatierra on Oct. 25, 1697. He dedicated the mission to Our Lady of Loreto for whom he had a keen devotion. (The tradition of Our Lady of Loreto commemorates the miraculous transference of the Holy House of Nazareth to the town of Loreto in Italy). Father de Salvatierra disembarked at Baja, California, carrying the emblem of the cross and the statue of Our Lady of Loreto. He declared her queen of the expedition and Patroness of all future missions in California. He brought his own life-sized statue of Our Lady of Loreto from Italy and described her reception by the new community: In a letter dated November 27, 1697, he wrote: “The next day we brought ashore the Holy Madonna. She was received on land with many salvos. We recited with the Indians the Ave Maria in their language and sang the litany of Loreto. In 1697, the Jesuits were given authorization by the Spanish King to Christianize the Baja area. During the next 70 years they founded 14 more missions in the region. 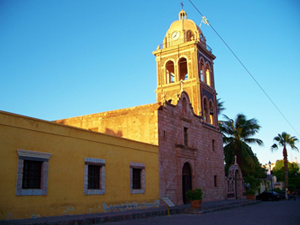 With the help of the local Guaycura Indians, construction on the first church of Loreto began in 1699. Jesuit Father Jaime Bravo initiated the building of a larger church in 1740. The town of Loreto remained the capital and the commercial centre of the region for almost 150 years—until disaster struck in 1829: A devastating earthquake demolished much of the town. Although the church of Loreto was damaged, its basic structure, “solid, squat and simple,” remained intact. In 1830 the capital was transferred to La Paz, a now-bustling city 210 miles south of Loreto. In 1854, diocesan clergy assumed control of the mission of Our Lady of Loreto. In 1967, Pope Paul Vl declared Our Lady the patrona principe of the Diocese of Mexicali. altarpiece, however, is anything but austere: Painted in radiant shades of crimson red and powder blue, it is adorned with an array of 3-D sculpted cherubs, angels, grapes and scrolls. 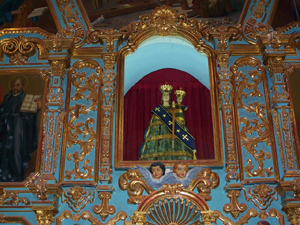 A statue of Our Lady of Loreto with the Infant Christ stands at the center of the altarpiece, directly above the tabernacle. Fittingly, for a shrine of Loreto, a large painting above the altarpiece depicts the Holy Family in their home at Nazareth. The first stone church is now a chapel, situated next to the presbytery. 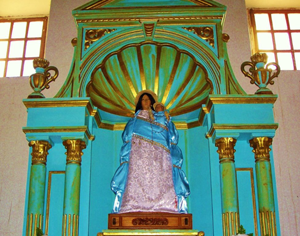 Dominating the space is the original statue of Our Lady of Loreto. The chapel’s ambiance—white-washed walls and an altarpiece in shades of robin’s-egg blue and cream—provides a soothing retreat for the weary soul. In 1769, Blessed Serra departed from the mission of Loreto and journeyed to Alta California (present-day California) where he founded a series of new missions and settlements—with names like San Diego, San Francisco, Santa Barbara and Carmel. But the mission of Our Lady of Loreto was the first of them all.